InSanity lurks Inside: Canada's Wonderland- Wonder Mountian's Guardian Name Change?! Canada's Wonderland- Wonder Mountian's Guardian Name Change?! What is going on up at Canada's Wonderland?! Wow, this one came way out of left field. According to Screamscape, Canada's Wonderland may have just quietly changed the name of their new attraction for 2014. 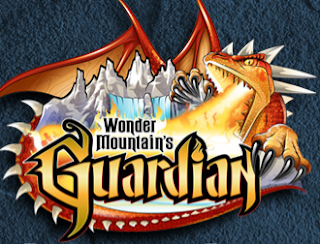 Wonder Mountain's Guardian may now be called "Guardian- The Quest of Gold" according to Season Passholder email. This is the image in question with the possible new name change. Nothing has been confirmed by Canada's Wonderland right now and according to their website, the name "Wonder Mountain's Guardian" is still listed as the attractions proper name. Could this be some clever photo-shopping at work or is the park really going with this new name? More information when we find out!